As the season shifts from summer to fall, produce departments begin to make way for new selections of in-season fruits and vegetables. 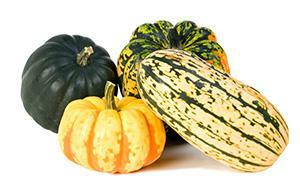 One of the most anticipated fall/winter vegetables is winter squash. Winter squash includes a variety of cultivars, subspecies and varieties, including acorn, buttercup, butternut, delicate, hubbard, kabocha, spaghetti, and sugar loaf, just to name a few. Brightly colored and delectably rich in flavor, winter squash adds both beauty and comfort to dishes and meals. And it’s loaded with nutrition. Winter squash is an excellent source of vitamins A and C, a very good source of fiber, manganese and vitamin B6, and a good source of copper, folate, magnesium, omega-3 fatty acids, potassium, tryptophan, and vitamins B2 and K. Winter squash is also loaded with carotenoid antioxidants. Winter squash can be boiled, roasted, sautéed, and steamed. And while the large varieties of winter squash can take a little bit of muscle to peel, they’re worth the effort! So the next time you’re craving comfort, reach for a winter squash and create a soothing, scrumptious meal full of wonderful health benefits. Some winter squash comfort meal ideas include classic pot roast with winter vegetables, butternut squash soup, stuffed acorn squash, and butternut squash macaroni and cheese.